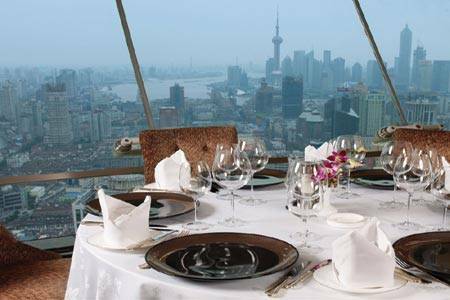 Oriental Pearl Tower Revolving Restaurant, 1500 Century Avenue, Fenghe Le, Pudong Park, Shanghai 200120. +86 21 5879 8888. This is the highest rotating restaurant in Asia. 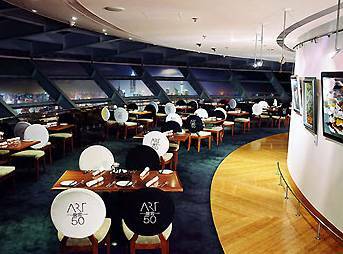 It is inside the second sphere of the Oriental Pearl TV Tower and has a one hour rotating circle. The building itself has become a visual symbol of Shanghai and modern China and features especially at night when the light show takes over. Daily Buffet Lunch 11am-4pm. Buffet Dinner 5pm-9pm. Subway Line 2 and get off at Lujiazui Station. 100 Century Avenue Restaurant, 91st floor, Park Hyatt Shanghai, 100 Century Avenue, Shanghai 200120. +86 21 6888 1234. Daily 11.30am-11pm. Overlooking the entire city. Expensive. Living Room, Park Hyatt Shanghai, 100 Century Avenue, Shanghai 200120. +86 6888 1234 Magnificent views of the Bund. Daily 7am-12 midnight. Flair Rooftop Restaurant and Bar, 58th floor, Ritz-Carlton Shanghai, 8 Shiji Da Dao, 8 Century Avenue, Pudong, Shanghai 200120. +86 21 2020 1717. Outside terrace offering real orientation. Located across the Huangpu River and giving (on a clear night) spectacular views of the famous Bund, the Huangpu River and across Shanghai. Daily 5.30pm-2am. Scena, 52nd floor, Ritz-Carlton Shanghai, 8 Shiji Da Dao, 8 Century Avenue, Pudong, Shanghai 200120. Ritz-Carlton Shanghai, 8 Shiji Da Dao, 8 Century Avenue, Pudong, Shanghai 200120. +86 21 2020 1888 A three meal restaurant offering specialty Italian cuisine. Jin Zuan, 53rd floor, Ritz-Carlton Shanghai, 8 Shiji Da Dao, 8 Century Avenue, Pudong, Shanghai 200120. Ritz-Carlton Shanghai, 8 Shiji Da Dao, (No.8 Century Avenue), Pudong, Shanghai 200120. +86 21 2020 1888 The very best Cantonese traditional cuisine. South Beauty, 10th floor, Super Brand Mall, 168 Lujiazui Xilu, Pudong, Shanghai. +86 21 5047 1817. Ask for window seats so you can have a great view of the Huang Pu River and the Bund. Take metro line 2 to Lujiazui stop, diagonally opposite exit no.1 (to the left of the unmissable Oriental Pearl TV Tower). Beside Shangri-La Pudong Hotel. Art 50 Revolving Restaurant, Novotel Atlantis Shanghai, in the Pudong district. Shanghai International Ocean Shipping and Finance Building stands out among many other high rises and is a landmark in Pudong. Its flying-disk shaped top floor completes a full revolution in 90 minutes. The restaurant is also an art gallery for local artists. 11am-2pm & 6pm-10pm. Cloud 9, 87th floor, Grand Hyatt Shanghai, Jin Mao Tower, 88 Century Avenue, Shanghai, 200121 China. +86 21 5047 1234. Ext. 8778/8779. Shanghai World Financial Center. +86 21 5047 1234. Mon to Thurs 5pm-1am. Fri 5pm to 2am. Sat 11am-2am. Sun 11am-1am. Enjoy a 360-degree view of Shanghai from one of the highest points in the city. Club Jin Mao, 86th floor, Grand Hyatt Shanghai, Jin Mao Tower, 88 Century Avenue, Shanghai 200121. +86 21 5047 1234. Ext. 8778/8779. Lunch 11.30am-2.30pm. Dinner 5.30pm-10pm. Cucina, 56th floor, Grand Hyatt Shanghai, Jin Mao Tower, 88 Century Avenue, Shanghai 200121. +86 21 5047 1234. Ext. 8778/8779. Lunch Daily 11.30am to 2.30pm. Dinner Sun to Thurs 5.30pm-10.30pm. Fri & Sat 5.30pm-11pm. Breathtaking views of the bund and the Shanghai skyline. The Grill, 56th floor, Grand Hyatt Shanghai, Jin Mao Tower, 88 Century Avenue, Shanghai 200121. +86 21 5047 1234. Ext. 8778/8779. Dinner only, Sun to Thurs 5.30pm-10.30pm. Fri and Sat 5.30pm-11pm. Canton, 55th floor, Grand Hyatt Shanghai, Jin Mao Tower, 88 Century Avenue, Shanghai 200121. +86 21 5047 1234. Ext. 8778/8779. A high-end Cantonese restaurant that takes up the entire floor. Lunch 11.30am-2.30pm. Dinner 5.30pm-10pm. Grand café, 54th floor, Grand Hyatt Shanghai, Jin Mao Tower, 88 Century Avenue, Shanghai 200121. +86 21 5047 1234. Ext. 8778/8779. Served by an express elevator from the tower's ground floor. Magnificent views of the city. Open 24 Hours. Piano Bar, 53rd floor, Grand Hyatt Shanghai, Jin Mao Tower, 88 Century Avenue, Shanghai 200121. +86 21 5047 1234. Ext. 8778/8779. A jazz club. Mon to Fri 5pm-1am. Sat to Sun 2pm-1am. Pauliner Brauhaus, Binjiang Dadao, near Pudong Shangri-La Hotel. +86 21 6888 3935 Daily 11am-2am. Good Bund views. YU Bar, Shanghai Marriott Hotel Luwan, 99 Jiangbin Road, Huangpu District, Shanghai, Shanghai 200023. Great views. Also City Bistro with riverside views. Laris, 6th floor, 3 Bund, 3 Zhongshan Dong Yi Road, (crn Guangdong Road), Shanghai 200002. +86 21 6321 9922. M on the Bund, 7th floor, 5 Zhongshan Dong Yi Lu , (entrance Guangdong Lu), Shanghai 200002. +86 21 6350 9988. Most certainly THE place to be in Shanghai, this classy split bar and restaurant has magnificent views over the Bund and the Pudong skyline. Daily 11.30am-2.30pm. 6pm-11pm. Mr and Mrs Bund, 6th floor, 18 Bund, 1 Zhongshan East Road, Shanghai. +86 21 6323 9898. 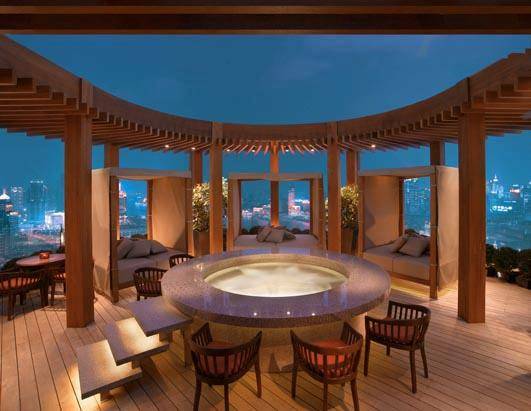 Amazing deck view. Bar Rouge, 7th floor, 18 Bund, 18 Zhongshan Dong Yi Rd, Shanghai. +86 21 6339 1199. Wonderful terrace Bund views. Daily 6pm-3am. Expensive. Glamour Bar, 6th floor, Five on the Bund, 20 Guangdong Lu, by Zhongshan Dong Yi La. +86 21 6329 3751 Good Bund view. Daily 5pm-late. Sir Elly's Terrace Rooftop, 13th & 14th Floor, The Peninsula Shanghai, 32 The Bund, 32 Zhongshan Dong Yi Road, Shanghai. 200002. +86 21 2327 2888 Open April till November. Daily 5pm-12 midnight. Weather permitting. Captain's Bar, 6th floor (top floor of Captain Youth Hostel), 37 Fuzhou Road, (between Sichuan Lu and the Bund) People's Square, Bund, Shanghai, China, 200002. +86 21 6323 5053. Good view of Pudong and the Bund and claimed to be China's best rooftop bar. Open Mon to Sat 9am-6pm. Metro Line 2, Nanjing Dong Lu Station. Happy hour 4pm-8pm buy one get one free (except wine). The Cathay Room, Fairmont Peace Hotel, 20 Nanjing Road East Shanghai, China 200002. 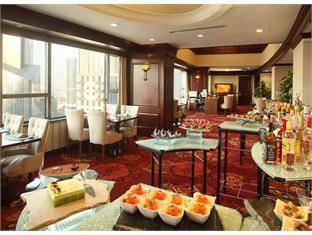 Features the only balcony on the Bund with stunning views of the Huangpu River. 8 1/2 Otto e Mezza Bombana, 169 Yuanmingyuan Lu, near Beijing Dong Lu, Shanghai. +86 21 6087 2890 Great views of the Pearl Tower from the balcony. Daily 4pm-late. Barbarossa Lounge, 231 Nanjing Xi Lu, Inside Peoples Park. By the Lotus Pond. +86 21 6318 0220 Relaxed cafe lounge with a 3rd floor view of skyscrapers. Marriott Cafe (360), 38th floor, JW Marriott Hotel Shanghai, Tomorrow Square Building, 399 Nanjing Xi Lu, Puxi, Shanghai 200003. 1 800 228 9290 from US and Canada. Near People's Square. 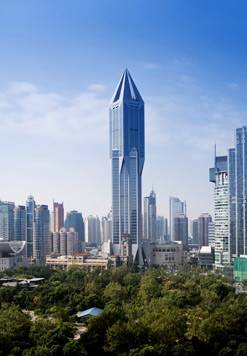 Shanghai International Ocean Shipping and Finance building stands out among many other highrises with its flying-disk-shaped top floor. JW's Lounge, 40th floor, JW Marriott Hotel Shanghai, Tomorrow Square, 399 Nanjing Xi Lu, Puxi, Shanghai 200003. +86 21 5359 4969. 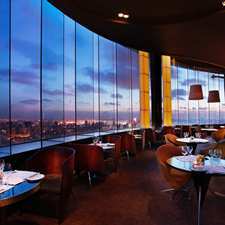 Blue Heaven Revolving Restaurant, Jin Jiang Tower, 161 Chang Le Road, Luwan District, Shanghai 200020. In the historic French Concession area of central Shanghai. Epicure on 45, 45th floor, Radisson Blu, 88 Nanjing Road (W), Puxi, Shanghai 200003, China. +86 21 6359 9999. Make a 360 degree tour in two hours with uninterrupted views of the Shanghai city skyline at 208 meters. Sky Dome Bar, 47th floor, Radisson Blu , 88 Nanjing Road (W), Puxi, Shanghai 200003, China. +86 21 6359 9999. Bird's eye view of the Shanghai city skyline. Danieli's Italian Restaurant, 39th floor, St Regus Hotel, 889 Dongfang Road, Pudong New District, Shanghai 200122. +86 21 5050 4567. In the business district. Pretty spectacular panorama of glittering Pudong. Eat in the Rooftop Restaurant. Sun to Mon 11.30am-2.30pm. Daily 6pm-10.30pm. Starwood. Revolving 28, 28th floor, Ocean Hotel, 1171 Dongdaming Road, Hongkou District, Shanghai 200080. Sichuan and extensive seafood dishes. Guests get a bird's eye view of the city. Offers a wide array of fashion Shanghainese dishes, especially Bird's nest, abalone and shark's fins. 11am-11pm. The Roof at Waterhouse, 5th floor, Waterhouse Hotel, 1-3 Maojiayuan Road, Zhongshan Road South, Huangpu District, Shanghai 200011. +86 21 6080 2988. 6pm-1am. emailWindows Scoreboard, 11th floor, 527 Huaihai Lu, near Chengdu Lu, Shanghai. +86 21 5382 7757. Great view onto Shanghai. Daily 5pm-late. Blu Bar, 50th floor, Pullman Shanghai Skyway, 15 Dapu Lu, Luwan District Town, Shanghai 200023. +86 21 3318 9988. 6.30pm-1am. Le Ciel Restaurant, 50th floor, Pullman Shanghai Skyway, 15 Dapu Lu, Luwan District Town, Shanghai 200023. 6pm-11pm. Zaffraan, 49th floor, Pullman Shanghai Skyway, 15 Dapu Lu, Luwan District Town, Shanghai 200023. 6am-12 midnight. International menu all day dinning and nightly buffet. Yu Rooftop Bar, 28th floor, Shanghai Marriott Hotel Luwan, 99 Jiangbin Road, Luwan District, Shanghai 200023. +86 21 5318 8888 Check out this restaurant's breathtaking setting giving unobstructed views of the quieter part of the Huang Pu River, Lupu Bridge in its rainbow flash to the North and the dark spread of the Expo on the opposing bank. Penthouse Bar On 39, Hilton Shanghai Hotel, 250 Hua Shan Road, Shanghai, China 200040. +86 21 6248 0000. Try a cigar, a signature Pina Colada or wine by the glass as you enjoy the music from the live band at this Shanghai bar and the stunning night-time views over the lights and skyscrapers of Shanghai. Nightly 6pm-2am. Sichuan Court, 39th floor, Hilton Shanghai Hotel, 250 Hua Shan Road, Shanghai, China 200040. Flame, Le Méridien She Shan Shanghai, 1288 Linyin Xin Road, Sheshan, Shanghai 201602. +86 21 5779 9999. An outdoor feature for the summer months overlooks the lakes and landscaped parkland. Lobby Lounge 10am-11.30pm. Park View. Seasonal. Starwood. Lake View, Le Méridien She Shan Shanghai, 1288 Linyin Xin Road, Sheshan, Shanghai 201602. +86 21 5779 9999. Stunning elegant interiors combined with panoramic views of the lakes and parkland. 11am-2pm. 5.30pm-10pm. Starwood. Shandy Bar, Le Méridien She Shan Shanghai, 1288 Linyin Xin Road, Sheshan, Shanghai 201602. +86 21 5779 9999. Dominated by the round bar and views of the lakes and parkland beyond. Flooded in lights, the bar offers panoramic exterior views surrounded by water and overlooking the beach. Mon to Thurs 5pm-12 midnight. Fri 5pm-1am. Sat, Sun & Public Holiday 12 noon-12 midnight. Starwood.